Pretty standard stuff. 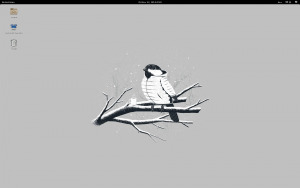 13.1 with Xfce desktop, Greybird theme, Faenza icons and Whisker Menu. openSUSE 12.3 Kernel 3.7.10-1.16-desktop Gnome 3.8.4 and a wallpaper which fits to the weather. Was I helpful? If yes please click on the star below - Thanks! This picture always reminds me of Michelangelo's "creation of adam" painting on the Sistine Chapel ceiling. Hello everyone. I thought I’d upload my current screen shots and introduce myself. I am Ken and I just installed 13.1. I absolutely love it, truly amazing. I ran SUSE before but that was a couple years ago and now I’m here on I’m wondering why I even left in the first place. Just finished installing openSUSE 13.1 just as I desire on my Dell XPS 13 Laptop, so I thought it best to share what it looks like.